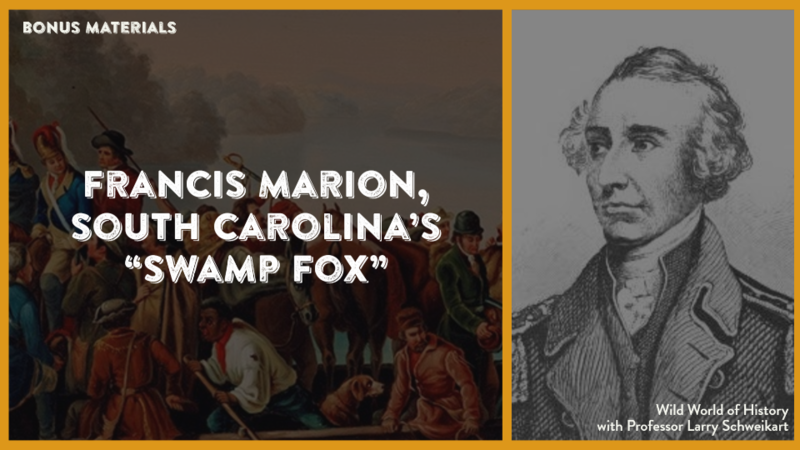 If Americans know about Colonel Francis Marion, the “Swamp Fox,” it is either from the Mel Gibson movie, “The Patriot,” or from the old Walt Disney television series. Actually Marion did not look or act like a hero at all. He was short (although Mel Gibson isn’t that tall, either! ), frail, and walked with a limp (he broke his ankle jumping out the window of a party he left early). Colonel Marion was an uneducated bachelor who was described as eccentric and unable to get along with his fellow military officers. He was not bold in his military tactics, but rather very cautious and prudent. Yet Marion was undoubtedly a courageous and deadly soldier, whose guerilla warfare techniques severely crippled British campaigns in the South, and helped to ensure American victory in the War for Independence. Marion first learned his “Indian style” of warfare while fighting the Cherokees in the Southern theater of the French and Indian War (1756-1763). With American Independence in 1776, Marion was commissioned a major in the South Carolina militia. He helped to repulse the British bombardment of Charleston in 1776, commanding a battery of cannon that crippled the British fleet and sent it running off the next morning “like earless dogs.” But the American triumph was short-lived. The Redcoats returned under Lord Cornwallis and captured Charleston and 5,000 Americans (under Benjamin Lincoln) in 1780. A short time later, another American army under General Gates was shattered at Camden. Without an army or a base of operations, Colonel Marion collected a ragged band of followers and slipped into hiding in the swampy lowlands of British-occupied South Carolina. During the next 2 ½ years Marion engaged in the devastating guerilla warfare that earned him the title of “Swamp Fox.” Although virtually in a sea of enemies, Marion and militia leaders Thomas Sumter and Andrew Pickens kept resistance alive in South Carolina until the Continental Army could recapture the region. Since over half of the South Carolina backcountry was Loyalist, or Tory, Marion engaged as much in civil war he did war against the British. The Swamp Fox and his mounted raiders hid and camped in the woods and swamps of the backcountry, foraging for food and supplies, and when the opportunity arose, striking at the British and Tory forces with ferocity. Ironically, the Swamp Fox and the other South Carolina guerillas eventually worked themselves out of a job. The Continental Army returned and Colonel Francis Marion, much to his dismay, found himself back in the regular army. Marion despised the rules and politics of professional soldiering and found himself constantly at odds with his commanding officers. When the British surrendered in Charleston (1783), he returned to civilian life, though retaining the commission of Brigadier General in the South Carolina militia. Nevertheless, Francis Marion can share some of the credit for American independence. Due to Marion’s and others’ guerilla bands, the British could never secure South Carolina permanently; their entire Southern offensive was stymied. Indeed, factoring in the North Carolina militia’s subsequent victory at King’s Mountain (1780), historians have rightly credited the Southern militia with expediting the American victory in the Revolutionary War. It was setbacks in Carolina, after all, that propelled Lord Cornwallis to his rash decision to leave the Carolinas and attack Virginia instead—a decision that landed him and 8000 troops on the Yorktown Peninsula in 1781. The “Swamp Fox’s” last years were spent rebuilding his war-torn plantation and serving in the South Carolina state senate. Marion finally married at age 56, and led the life of a country gentleman. When Francis Marion died in 1795, the “little Colonel with a limp” had the respect and admiration of the nation whose independence he had fought to secure. Larry Schweikart and Dave Dougherty, The Politically Incorrect Guide to the American Revolution.